Finau Maka gives new meaning to the term "impact player". At 6'2" and 242lbs, Tongan number 8 Maka is an imposing presence from the base of the scrum, with his now trademark afro hairstyle making him a distinctive figure on and off the field. 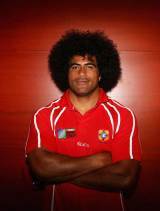 A late starter in international rugby, Maka made his debut for Tonga against the USA at the 2007 World Cup, aged 30. He had originally held aspirations of following his elder brother Isitolo into an All Blacks shirt but later turned his attentions to playing at the 2007 World Cup in the colours of France. Maka qualifies for France through residence, having played for French heavyweights Toulouse since 2001. French chief Bernard Laporte decided against selecting Maka for the World Cup, leading to him grasping the opportunity to represent the nation of his birth at the tournament. His explosive pace and bullish ball carrying ability immediately marked him out as a danger man in the hugely combative Tongan back row, alongside Hale T-Pole and captain Nili Latu. With a try and a man of the match performance under his belt after his debut, Maka continued his good form into the crunch fixture against Samoa, and both he and Tonga were able to hold out for a memorable 19-15 victory. Maka highlighted a change in style for the Tongan side at the World Cup, with his excellent skills and discipline allowing them to compete at the breakdown with the best in the world. This change was evident when the Tongans were narrowly defeated 30-25 by eventual World Champions South Africa in the next group game. By the time Tonga had exited the tournament at the hands of England, Maka had ensured that he was no longer the French Top 14's best kept secret. Both he and the Tonga side returned to a hero's welcome on the island. Maka's exploits at the World Cup can now be added to his achievements at club level, where he has won the Top 14 and Heineken Cup on two occasions during his time with Toulouse.